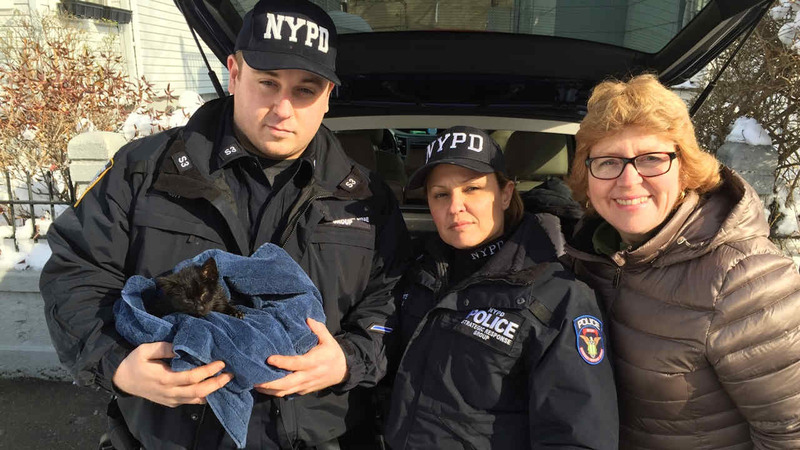 WINDSOR TERRACE, Brooklyn (WABC) -- Two NYPD officers rescued a kitten that became trapped in the wheel well of a car in Brooklyn Monday afternoon. Officer Christopher Rinelli and Officer Kenia Marte, with the Strategic Response Group, were flagged down by a woman at the intersection of Ocean Parkway and Sherman Street in the Windsor Terrace section just after 12:30 p.m.
She told the officers that a black kitten ran into the street, causing traffic to stop. Upon exiting her vehicle, she saw the kitten climb up into the undercarriage of the car. Rinelli, 28, and the 39-year-old Marte immediately made the scene safe and began looking for the kitten. The officers were not able reach it, so they used a jack to lift the vehicle and removed the wheel. Officer Rinelli was then able to reach the female kitten and carefully placed her into a towel. Although cold and wet, the kitten appeared to be unharmed. The owner of the car, Geraldine Cassone, took custody of the two-month-old kitten and intends to adopt her. She has yet to name the lucky post-storm stray.